Carolingian, Charles the Bald. AD 840 to 875. King of the West Franks. Denomination : Silver denier. Mint : Le Mans. Size : 19.9 x 20.3 mm. Weight : 1.76 grams. Reference : MEC 872-4. MG 905. D 559. Grade : gVF, full strike with attractive old toning. Obverse : Karolus monogram with GRLTIL D-I REX around. Reverse : Short cross, with CINOMANIS CIVITAS around. 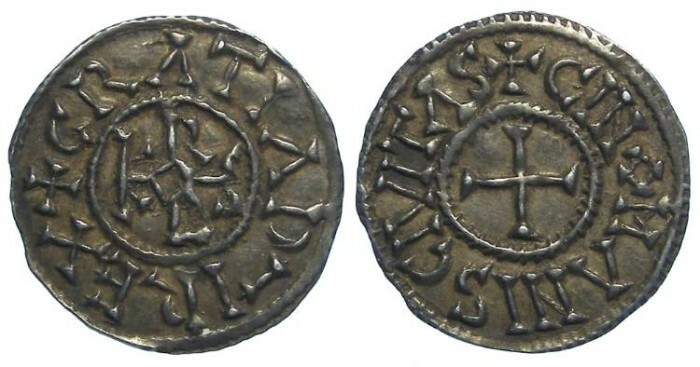 There are coins on this type issued by both Charles the Bald (see MEC #872 TO 874), Charles the Simple (see MEC #993 to 995), and later by Hugue II under LeMans as a feudal coin after the Carolingian period (Fecamp 7045) The Charles the Bald and Charles the Simple can be distinguised based on style but both will be in the 1.7 gram range. The later Feudal copies of Hugue are much ligher, more in the 1.25 gram range.